Mortadella (Italian pronunciation: [mortaˈdɛlla]) is a large Italian sausage or luncheon meat (salume [saˈluːme]) made of finely hashed or ground, heat-cured pork, which incorporates at least 15% small cubes of pork fat (principally the hard fat from the neck of the pig). Mortadella is a product of Bologna, Italy. It is flavoured with spices, including whole or ground black pepper, myrtle berries, and pistachios. Traditionally, the pork filling was ground to a paste using a large mortar (mortaio [morˈtaːjo]) and pestle. Two Roman funerary steles in the archaeological museum of Bologna show such mortars. Alternatively, according to Cortelazzo and Zolli Dizionario Etimologico della Lingua Italiana 1979-88, mortadella derives its name from a Roman sausage flavoured with myrtle in place of pepper. The Romans called the sausage farcimen mirtatum (myrtle sausage), because the sausage was flavoured with myrtle berries, a popular spice before pepper became available to European markets. Anna Del Conte (The Gastronomy of Italy 2001) found a sausage mentioned in a document of the official body of meat preservers in Bologna dated 1376 that may be mortadella. Mortadella originated in Bologna, the capital of Emilia-Romagna; elsewhere in Italy it may be made either in the Bolognese manner or in a distinctively local style. The mortadella of Prato is a Tuscan speciality flavoured with pounded garlic and coloured with alchermes. The mortadella of Amatrice, high in the Apennines of northern Lazio, is unusual in being lightly smoked. Because it originated in Bologna, this contributed to the naming of the American sausage meat "bologna". Mortadella Bologna has Protected Geographical Indication status under European Union law. The zone of production is extensive: as well as Emilia-Romagna and the neighbouring regions of Piedmont, Lombardy, Veneto, Marche and Tuscany, it includes Lazio and Trentino. In Puerto Rico, "smoked mortadella" is sometimes confused with commercial salami, or with salami cotto, because cafeterias, panaderias, colmados, and restaurants buy the bulk of whole smoked mortadella. While salami may contain pork, beef, veal and small pieces of fat uniformly distributed within the sausage, mortadella has the traditional larger chunks not so uniformly distributed. Its diameter is much larger than that of hard salami and more closely resembles salami cotto (cooked) in size, hence the confusion of some people. 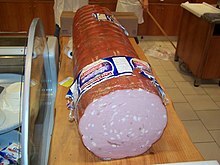 It is smaller in diameter than the traditional mortadella de Bologna because the smoking process causes some shrinkage. It is best served at room temperature to bring out its rich flavour. In Romania, a similar cold cut is also known as pariser or parizer. It is a type of artisan bologna. In Hungary, a similar product is called, in Hungarian, mortadella and a plain variety called pariser, parizer or párizsi. The term parizer is also often used in Bosnia-Herzegovina, while parizier is used in Albania, Kosovo and other territories of the Balkans. The classic Italian mortadella is widely sold in supermarkets along the entire Adriatic coast. In Greece, where there is a smaller version in addition to the regular one, that variety is called Parizaki or Mortadelaki, and in Bulgaria, Slovenia, Croatia, Serbia and North Macedonia, the product known as mortadela is widely eaten. In Poland, mortadela slices are sometimes dipped in batter, fried and served with potatoes and salads as a quicker (and cheaper) alternative to traditional pork chops. In several countries, such as Egypt, Iraq, Syria, Lebanon, Jordan, United Arab Emirates, Qatar, Saudi Arabia, Kuwait and Israel, halal or kosher mortadella is sold, which is made from chicken, beef, or turkey. The Palestinian Siniora brand is the first in the region, a mortadella with sliced olives, pistachios or pepper. Lebanese Al-Taghziah is a famous brand that is sold around the world. The most popular brands in the GCC are Americana Group and Halwani Brothers. It is also popular in Iran, albeit usually made with beef or lamb, and called commonly kaalbas, from Russian kolbasa. Pork mortadella is sold in Egypt, Lebanon, Jordan, Syria, and the UAE. A similar commercial sausage product that omits the cubes of pork fat, called bologna, is popular in the United States. A variety that includes olives and pimentos is called olive loaf. In Russia, a very similar product is called "doctor's sausage" (Russian: «Докторская» колбаса). However, this product is normally made from a beef and pork mixture, and does not include pieces of fat (sausages with pieces of fat are called "Lubitelskaya" and "Stolichnaya") or myrtle as a primary spice, being instead flavoured with just coriander and nutmeg. It also traditionally contains eggs and milk, usually absent in traditional mortadella. Chả lụa or Vietnamese mortadella is sometimes used as an accompaniment to the Vietnamese dish bánh cuốn. ^ "Mortadella - Define Mortadella at Dictionary.com". Dictionary.com. ^ "Farmer Jack — a Siniora Sons Inc. Company". farmerjack.ps. Retrieved 2016-02-11. ^ "The Return of Mortadella". The New York Times. 13 February 2000. ^ "Bologna Journal; Coming to a Deli Near You: A Long-Taboo Sausage". The New York Times. 10 February 2000. ^ "Stall 1006 - Banh Cuon - noodlepie". typepad.com. Wikimedia Commons has media related to Mortadella.